Even after reading all the problems knitters were having with the Cabled Bolero, I still went for it. I even decided to use a different gauge yarn that had more drape. I also used a smaller needle size because of the yarn change. It was a total recipe for disaster. I was intrigued by Norah Gaughan's design (she is a genius). The sweater is made seamless except for the collar. 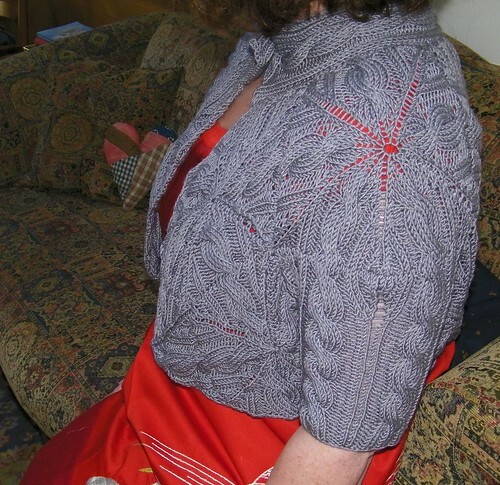 You knit a cabled pentagon, and then you keep adding pentagons to make a shrug. I don't know how she thinks of these creative designs, but I'm glad she does. I never would have attempted this pattern a year ago, or even six months ago, but Wisteria really boosted my knitting confidence and I wanted to try something challenging. 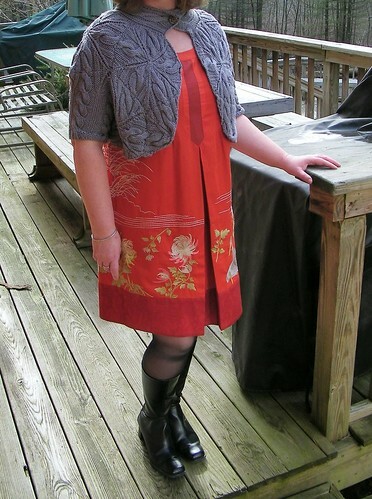 I followed Hisknits modifications (Ravelry Link), and used Classic Elite Wool Bam Boo. 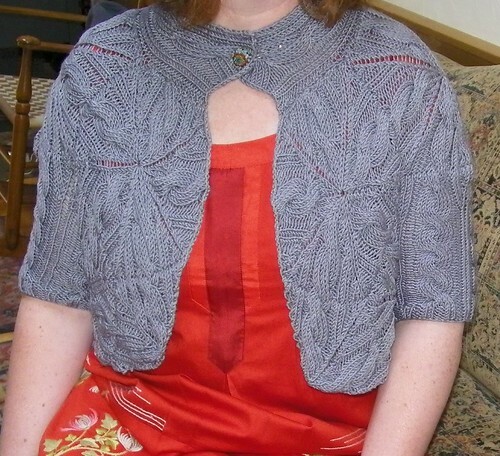 What I ended up with was more of a lace shawl type shrug with sleeves. I really like how it turned out. This shrug benefits from blocking, because the pentagons tends to make some funky pointed shapes, but the blocking takes care of that problem. It was fun knitting the pentagons, but the whole time I was knitting, I was thinking to myself, "I'm never going to wear this thing." Luckily, I was wrong. The bolero looks lovely on you! I love the pattern. Congratulations on tackling something new and challenging. Oh, that is so beautiful! What a great job. It's so intricate, yet not fussy. It looks lovely on you. stunning! this looks so great on you. the color and everything is perfect. i am so glad it all worked out for you. how is tangled yoke coming? SEN-SA-TION-AL! Wowie-wow-wow! LOVE the yarn choice; it looks better, drapey and silky. Very, very nice. P.S. Who's your photog? Mine stink - I can't get ONE picture out of them, let alone four - and yours are all good! Well done for sticking with it, it certainly looks good. Well your fearless knitting really paid off! Love this whole outfit! What great work! You should be proud!